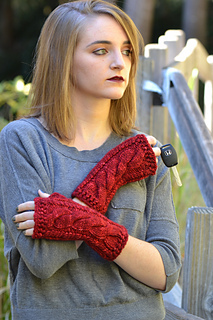 Quick to knit and fun to wear, these gloves are elegant in their simplicity. 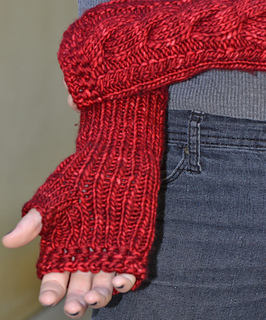 Elastic ribbing on the palm side allows a great fit. The edges are worked in the interesting pattern of wrapped bundles. Basic cables run along the top of the glove and create a wonderful texture that is accentuated by beautiful colors of a variegated yarn. Yarn suggestions: Any bulky yarn or two strands of DK-weight yarn held together will work. 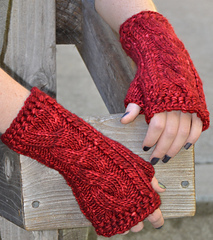 Note: If you do not need a wide thumb for the size L, stay with size M numbers for waste yarn part throughout thumb instructions. Make these gloves longer by adding another chart repeat before placing thumb. Make border on both ends using different color. In other words, have fun ! !